Recent appeals from the Russian Foreign Ministry to put an end to the confrontation over Iran’s nuclear program have not gone unheard. Dissension has been reported in the Anglo-American coalition, which only a short while ago was considering a joint preemptive strike on Iran. A gradual withdrawal from the idea of a forceful resolution of the “Iranian issue” may distinctly reduce the threat of war in the region, given Iran’s serious military potential. Russian Foreign Minister Sergey Lavrov recently spoke at the Conference on Interaction and Confidence-Building Measures in Asia, which was held in Astana. “At the top of the current international agenda is the situation surrounding the Iranian nuclear program and the nuclear issue on the Korean Peninsula. As a way to resolve these issues, we don’t see any alternative to the negotiations in the current format. This is the only way to make Teheran and Pyongyang address the concerns of the international community,” said Lavrov at the ministerial meeting. The day before Lavrov made this statement, Israeli authorities, having yielded to pressure from the West (and from the UK especially), revised their plans to carry out a military strike on Iran. According to Israeli media, a special envoy of the British government had delivered a message to the Israeli administration from Prime Minister David Cameron, who sternly requested that Tel-Aviv refrain from using military force against Iran. Israeli analysts believe that the uncompromising memo from the British side, along with telephone conversations between Prime Minister Benjamin Netanyahu and German Chancellor Angela Merkel, have cooled Israel’s belligerent mood towards Iran. Still, it is hard to believe that the intelligence services of both Israel and the United States will simply ignore Iran’s serious military capabilities. If war erupts in the region, hostilities will be much more desperate and much less predictable than those in Iraq during the Desert Storm and Shock and Awe operations. Even publicly available data provided by reputable international sources such as IISS Military Balance, Jane’s Defense, Defense Daily Aviation Week & Space Technology, and others suggest that the Iranian Armed Forces are capable of inflicting considerable, if not insufferable, losses on “Western” forces, in the case of armed conflict. 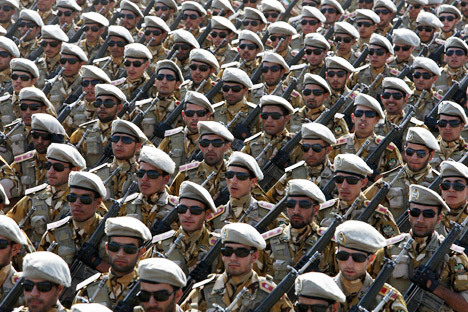 Iranian land forces include somewhere between 350,000 and 465,000 people, of whom at least 230,000 are contract soldiers; the rest are conscript personnel. Outside of these numbers, there are also up to 350,000 reserve servicemen. Despite the obvious weaknesses of Iranian land forces against a possible Western coalition, a ground campaign in a country with highly mountainous terrain and 70 million hostile citizens would be unfeasible and limited to amphibious operations. Given Iran’s powerful coastal defense system and advanced small war tactics, amphibious operations would still cost invading forces serious losses that would be unacceptable ahead of the elections in the United States, France and Germany. Iran has many retaliation options. “As of today, the Army and Navy of Iran have tactical missiles that can effectively strike the marine and land forces of the United States in the region. Most of the U.S. military facilities are within the range of Shahab-3 short-range missiles, which have a range of 1,240 miles,” Kostin said. Furthermore, Iran may target key dual-purpose infrastructure facilities, such as ports, desalination plants and other facilities used by U.S. forces. And while strikes on Persian Gulf cities would make little sense militarily, their psychological and political effect on countries in the region could be considerable. “Having control of the Strait of Hormuz, Iran is also capable of influencing global trade. Even hypothetic risks for ships will make insurance rates skyrocket, which could eventually result in a global energy supply crisis,” said Kostin. Damage to the oil infrastructure of any Persian Gulf country could bring about not only economic but also environmental disaster. Bombardments of nuclear facilities in Iran itself, for instance the nuclear power plant in Bushehr, could “produce a Fukushima-type accident, albeit at a smaller scale,” according to former French Ambassador to Iran François Nicoullaud. “The plant is located on the shore of an inland sea and is surrounded by many coastal states — the Persian Gulf countries,” Nicoullaud said. He also mentioned that the Iranian nuclear plant in Fordow, operating 6,500 feet underground, could be damaged, but it would take a nuclear strike to completely eliminate it. Therefore, it seems there is no way out for the West and Iran, except to continue with the talks.